Kickstarter project is up! 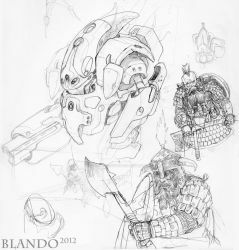 a 40 page b/w sketchbook full of conceptual art and characters! Please check it out and pledge so i can get this book out Thanks! Kickstarter Project! Only 5 days left! I'm a freelance illustrator who works on concepts, cartography, and boardgame design for a living. I regulary work for Paizo's Pathfinder, Wizards of the Coast publications, Mayfair Games, and many other companies. I'm always open for commission, so please feel free to email me if you have projects or questions. I take Paypal, and checks. Please don't hesitate to ask questions and such. Hey everyone, my Kickstarter project is up! Please check it out and pledge so i can get this book out Thanks! My son bought me your book, How to Draw Fantasy Art & RPG Maps, for Christmas. The book looks great. Good Sir I very much look forward to your work in Exalted coming up! You do some really talented work, especially your maps. Thank you for adding me to your favorite. Lovely stuff, particularly the pike & musket era. (I'd be asking if you did commissions like the below poster if I wasn't out of money, put it that way).